The Hunter 51059 LowProfile is our best flush mount ceiling fan, which has a low profile design and can fit in rooms with 8 feet and below or even 7 feet and below ceilings. The 3-speed motor is quiet and the design offers for a simple installation. It has an air flow of 2,902 CFM and can help you save up to 47% on cooling costs. 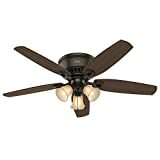 Our step-up pick is the Hunter 59269 Anslee and this ceiling fan comes with a lighting kit that contains 2 CFL bulbs at 14 watts with a medium base design. The fan makes use of a pull chain mechanism to change the speed. It has a reversible mode for the winter season for saving up on heat costs. The budget pick is the AirrForce 42″ Hugger and the motor is very quiet and has a total of 3 speeds for you to choose from. The reverse option is great for the winter and the blades are made with a combination of maple and dark cherry finish. It has a pull chain mechanism to adjust the speed. A flush mount ceiling fan means that it is attached without much space from the ceiling to the fan. Flush mounts are better and safer than regular mounting mechanisms because they are closer to the ceiling. They are different from traditional or downrod ceiling fans due to the design. Ceiling fans are great for those who do not have a lot of space in their home for other types of fans. Compared to a stand fan, ceiling fans are smaller but can be a bit heavier. However, they usually have bigger blades compared to regular electric fans out there, which makes them special when it comes down to installation. Choosing the appropriately designed ceiling fans is important for indoor use. The design should match your furniture and other parts of the interior design. It should not overpower the other elements of the room so you should choose one with blades that do not have a lot of space taken for small rooms and should not be too small for big rooms. A ceiling fan is beneficial for those who live in really hot climates because air would circulate better with such a fan. A ceiling fan can also be ideal for area or spaces that do not have enough room for stand fans and desk fans. Moreover, most ceiling fans are attractive and some even have lights for dual purpose use. If you want to save money on monthly expenses and cannot afford an air conditioner in your home or business area, or if your items cannot be in an air conditioned area, you should stick to a ceiling fan because it gives off natural air around the house, room or area and can help ventilate it during the summer or hot months. Size of the blades: most flush mount ceiling fans can be small or large. It is important to choose a fan that is right for your room or area. Large rooms should have longer bladed flush mount ceiling fans while smaller homes should have a smaller set of blades to make sure it does not make the room too uncomfortable. Number of blades: do consider a flush mount ceiling fan that has the right number of blades to ensure that it gives the right blowing power for your room with the less amount of electricity needed. 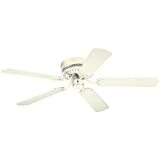 More blades usually mean more power for a flush mount ceiling fan. It usually has 3 to 5 blades. Ease of mounting: a good flush mount ceiling fan is one that is easy to mount. The instructions and all of the mounting hardware should be included with the package of the flush mount ceiling fan so that it will be simple to install. Speed settings: do know the speed settings of the flush mount ceiling fan so that it will be useful when it is not too hot. Wattage: you must also know the wattage of the flush mount ceiling fan so that it will be easy for you to track your monthly electric consumption in your home, office or area. The wattage can also come in a sticker that indicates its energy efficiency so it is a good thing to look for these stickers to know more. Color choices: many flush mount ceiling fans can have color choices such as white, gray or brown so it depends upon your preferences and the style of your office or home to choose the right color for your needs. Most color choices can complement interior designs. Wall or remote control: most flush mount ceiling fans can be wall controlled but some can also be remote controlled. You should choose whichever is the more comfortable one for you. Do know that wall controlled switches need an electrician or an expert to install, compared to easy install remote controlled ones. The Hunter 51059 LowProfile is our best flush mount ceiling fan which can cover up to 100 square feet of room area. It has a fan blade length of 42 inches and has a choice of white, bronze and walnut for the blade color and style finish. The clean lines can be ideal for those who have a modern style room, this flush mount ceiling fan has a 1-inch down rod and is backed by a limited lifetime warranty on the motor. The only con about the Hunter 51059 LowProfile that is not a major concern is that some light kits are not compatible with it, so you can ask the manufacturer for a list of light kits that are compatible with it. The Hunter 59269 Anslee is our step-up pick, in which you have a choice of white, silver and bronze for the blade finish. Each of the blades measure 46 inches long and it has sufficient cooling power for most rooms without the jarring noise levels. Great for low ceilings, the lighting kit has a white glass casing to make it elegant looking. A limited lifetime warranty for the motor is also available. The AirrForce 42″ Hugger is our budget pick, which has an oil rubbed bronze finish for the body, for those who want an antique style décor element. 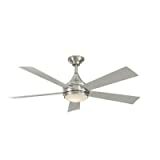 It has a total of 4 blades and is ideal for smaller rooms who want a hugger or flush mount ceiling fan. If you want a traditional style flush mount ceiling fan then this is a good choice to consider. The lighting kit that can match this ceiling fan would be one with candelabra bulbs. The Hunter 53119 SeaWind is an ETL listed fan that is damp rated and applicable for outdoor use. It can be used in sunrooms, patios, porches and the like. It has a total of 5 blades that span 48 inches each. The noise levels are low on this fan and it has a limited lifetime motor warranty as well. The Emerson CF144WW Fan is a great indoor fan with blades that span up to 44 inches. In addition to that, it can also be used outdoors due to the design of the blades. A light fixture is also included in this ceiling fan and it has a total of 6 speeds that can be switched with a remote control. The Hunter 55042 Stockbridge is a large fan at 70 inches and comes with 5 blades, each with a walnut and medium oak finish. Including a light kit that comes with 3 candelabra light bulbs at 60 watts each, there are 3 fan speeds plus a reverse feature for the winter. It has a lifetime motor warranty. The Hunter 53327 Builder has a span of 52 inches for the blades and comes with 3 candelabra bulbs for the light kit. Ideal for use indoors, this bronze finished fan comes with a pull chain mechanism and a reverse control for the winter. The Hanlon 52in. Indoor/Outdoor has an air flow rate of 5,203 cfm with a light kit having a 3,000k color temperature. The stainless steel material makes it ideal for both indoor and outdoor use. The dome light is stylish along with the 5 outdoor-suitable silver blades. The Home Decorators Windward is a brush nickel finished fan that comes with the bracket for installation. It has an air flow of 5,201 cfm and comes with a total of 5 blades. It has a pull chain operation and is ideal for indoor use. It has a lifetime warranty for the motor. The Westinghouse 7805300 Casanova has a pull chain mechanism but you can also add remote and wall controls if you like. It has an air flow of 5,098 cfm and comes with pine blades that were white washed for a modern design, spanning up to 52 inches each. You can also add a light kit for this model. Other flush mount ceiling fans were not in our list because they were flimsy in their motor and in their blades. The flush mounts were also not very durable in each unit so they were unreliable to mount. Q: What are the different kinds of mounting systems for a ceiling fan? The standard mount or the downrod mount is the most common type of ceiling fan mount and can usually range from 3 to 5 inches on its downrod. It is ideal for most rooms with at least 7 to 8 feet in height. The downrod usually has a diameter of 1/2 to 3/4 inch and can have a metal pipe to connect it from the ceiling to the fan. The extended mount is a larger and longer downrod type that can go for up to 6 inches to as far as 120 inches for larger, industrial ceilings that can go for up to 20 feet in height. These extended downrod mounts are the best for larger rooms with higher ceiling heights of at least 8 to 9 feet from below. The flush mount or the hugger mount is the type of ceiling fan mount that is ideal for small rooms with lower ceilings of at least 7 feet from below. It is a solution for areas that require a ceiling fan but have a ceiling that is too low for a downrod mount. 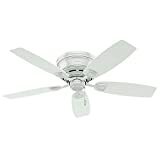 Since the safe zone installation for a ceiling fan is at least 7 feet, it is the best for those with lowered ceilings. The sloped mount or vaulted mount is ideal for those who live in an attic or have a room with a sloped ceiling or vaulted design. It should be at least 30 degrees sloped for you to install a sloped mount for your ceiling fan for it to work well. Q: What should be the size of my ceiling fan depending on the size of my room? Q: What are some of the most common misconceptions with ceiling fans? Flush mount ceiling fans are the only solution for an 8-foot ceiling: the truth is that you can buy downrod style ceiling fans and they will fit most ceilings up to 8 feet high. Those with 7 feet ceilings are the only ones that are advisable to have a flush mount ceiling fan or those who don’t need a lot of cooling because airflow is not very good with flush mount ceiling fans. Wobbling can occur on downrod mounted ceiling fans: the truth is that it is all in the mounting and how it is mounted. While flush mounted or hugger type ceiling fans are safer from wobbling, even downrod ceiling fans and standard ones can have little to no wobbling at all if they are installed properly and the blades are properly balanced and have no damage whatsoever. Smaller fans are the best for smaller rooms: this is not always true because it depends upon the size of your room. It is best to get the appropriate size and get a slightly bigger one for your room. If your fan is too small then the fan’s motor might suffer a lot because you will need to turn it up to the higher speed. Thus, it is more economical to go for a larger fan size. Longer blades equate to more generated power: this is not always true and it all depends upon the power of the motor. You have to equate the motor power and the speed along with the size of the blades. If your motor is too small or not powerful enough then it is not ideal to spin the whole fan with blades that are too long. Ceiling fans that are remote controlled are more expensive: this depends on the unit and the mode of installation. If you install a remote controlled ceiling fan and already have a wired installation, you can actually save up on the initial expense. Q: What should be the downrod size for a ceiling fan if you have higher ceilings? Q: What should be the height of your ceiling in order to use a flush mount or hugger fan? The minimum height requirement for a ceiling to be installed with a ceiling fan is at least 7 feet from the ground. This is to prevent children and anyone to have potential accidents with the ceiling fan. Ceilings with 7 to 7 1/2 feet of height can benefit from a flush mount ceiling fan because it is designed for most lowered ceilings out there. The distance from the blade to the ceiling should be 12 inches to 18 inches and this cannot always be achieved if you have a flush mount fan but you can slightly meet the requirements compared to having a downrod mount, based on the height from the floor to the ceiling requirement. Q: Can a ceiling fan replace a chandelier? Homes where ventilation is an issue, such as really hot summers can really make use of a ceiling fan that has a built-in light fixture so you can get a chandelier and a fan in just one go. This is also economical to use during the winter. However, if your home is more on the style and ventilation is not an issue then a chandelier may be a better option for you. However, it does not mean that you don’t have to install a ceiling fan – some rooms do need one, such as in the kitchen. Q: What do I need to know about ceiling fan blades? A: When choosing ceiling fans , knowing all about the blades is important. Choosing the appropriate material for your ceiling fan is important, whether you are concerned with the design aspect or the durability of the fan itself, especially if it will be used outdoors or on a patio, covered porch, deck and the like. Number of blades: the number of blades on a common ceiling fan is usually from 3 to 4, and anything above that is pretty much overkill. 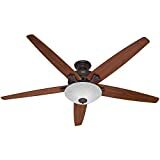 According to Energy Star’s data, you need to have a more powerful motor for pushing air or moving air with more blades, so having 3 to 4 blades on a ceiling fan is sufficient if your motor is in the average power to get the best out of the ceiling fan in the long run. • Smaller rooms should have a set of shorter blades so as not to give too much drowning airflow around the room. It is also much fitting because it will be safer to install. • Larger rooms like the kitchen may require longer blades because they need to cool a larger area than the smaller room. They also fit due to the larger dimensions of the room. • Medium density fiberboard (MDF) – is also called particle board and it is one of the most common types of blade material used in a ceiling fan. • Real hardwood – this is used mostly in higher end and expensive ceiling fans for better ventilation, a quieter atmosphere and more carved designs. • Damp-rated or wet-rated – some fan blade types are also wet-rated for summer outdoor use or damp-rated for summer use. These are ideal for the patio, porch, deck or outdoor setting. • Metal – some rare industrial fans and other outdoor fans can be made of metal or some alloy material that makes them noisier and not ideal for indoor use. They are, however, durable. You really have to consider the material of your blades in order to create a certain quiet atmosphere with your ceiling fan when you sleep. For instance, metal fans can be a little bit noisier than wood ones, so they should only be placed outdoors or on large commercial areas or in the kitchen where sound is not an issue. Q: How are 4-blade and 5-blade ceiling fans different from each other? Noise levels Less quieter than the 5-blade fan because it has less blades because it circulates more air. Quieter than the 4-blade fan because it tends to circulate less air than that fan. Efficiency They can be more efficient if noise is not a problem due to moving more air in the long run. They can be less efficient but with lack of noise because of not moving a lot of air around. Design It depends upon how the 4-blade ceiling fan was designed. It also depends on the manufacturer’s design of the 5-blade ceiling fan. Q: How do I know if I need a flush mount ceiling fan? If tall people live in your home and the ceiling is very low, you need a flush mount ceiling fan. Flush mount fans sit higher from the ground compared to downrod fans so they are not very obtrusive for tall people who are perhaps 6 to 7 feet tall. If the design of your ceiling is low at around 7 feet then you need the flush mount hugger for safety purposes. If your ceiling is flat enough then it is capable of being installed with a flush mount ceiling fan. If your ceiling is not flat, or if it is slanted or vaulted, you should go for a sloped adapter with a downrod instead. Nonetheless, flush mount huggers are ideally installed on flat ceilings. Q: What is the typical power consumptions of various speeds of my ceiling fan? The speed settings of a ceiling fan are important in preserving the life of your motor. While most warranty policies cover the motor for a longer period of time, it is still wise not to keep using the highest speeds of your fan to not break its motor and parts easily. Flush mount ceiling fans should have a decent motor. This is because of the fact that this kind of ceiling fan is closer to the ceiling so it might not easily generate more power due to the position. The ceiling can block some of the air that is generated so this can be a problem for the ceiling fan in general. Q: What are the benefits of a remote controlled ceiling fan? • It is more convenient to operate, especially for the seniors or those who cannot easily locate the wall control or can’t reach the pull cord mechanism. 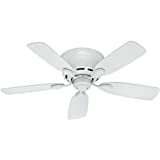 • Remote controlled fans are super easy to install versus wall controls that require an electrician for you to install. • Some remote controlled ceiling fans can be part of your home automated system, such as with Amazon Alexa. This adds a lot to the convenience of operating the ceiling fan to reduce on electricity costs monthly. Q: How do I clean a ceiling fan properly? 1. First, when you clean the ceiling fan, make sure all furniture and flooring are covered so as not to get the dust from the ceiling fan. 2. Next, dust the fan with a duster and then use a sponge or cloth that has been dampened to wash it. Don’t put too much pressure to avoid bending the blades. You should only use the recommended cleaner by your manufacturer based on the material of your blade. 3. Make sure you dry the blades thoroughly before you leave it running, so as not to make dust stick onto it. 4. You can use special cleaning tools such as a U-shaped brush or even use an old pillowcase to easily clean the fan blades from all sides. Q: How do I fix a wobbling ceiling fan? Check the balance of the blades. This is the first step to knowing if the fan is balanced enough not to cause a wobble. With the fan off, put a clothespin to measure if there are wobbles when you turn on the fan. You can add coins to the tip of the blades if one of them is wobbling or many of them are not balanced at all. You can add coins until everything is completely balanced and the wobbling stops in the ceiling fan. Manually bending the blades can be done, but carefully. To do this, you need to measure the distance of each blade from the ceiling and make sure every single one of them are almost the same distance from it. You can also try to inspect the installation of the motor to see if everything has been installed properly. Sometimes, a wobbling ceiling fan is caused by an improper installation on the motor covering, so you need to remove it and balance it well. In addition to that, the junction box may also need to be checked. Look for the screws on the junction box and tighten them but don’t over tighten them. The wobbling may stop if you secure the junction box of the ceiling fan properly. Q: How do I know which light bulb to choose for the light fixture of my ceiling fan? Know if the ceiling fan will be the only source of light in your room. If this is the case, you need at least 800 lumens for any light bulb, whether it is the traditional light bulb or the new LED light bulbs for energy saving. If you want to save up on lighting, you can also add some lamps and recessed lighting if the ceiling fan won’t be the center of attraction. If your ceiling fan won’t be the only light source, you can opt for a dimmable light. You can go for any kind of light bulb, such as LED, halogen, CCFL and incandescent. But for the best results, you should go for LED light, despite its price. This is because LED is not only eco-friendly but also very bright and longer lasting than other light bulbs, and consume very less wattage compared to them. Know the height of the ceiling in your room. The height can play a role in how much brightness you need for your lighting. This is why if you have higher ceilings than 8 feet, you may need to go with a higher lumen output for your light bulb. Know if you need the lighting for a longer period of time. You should know the rated life of the light bulb, e.g. 15,000 hours or more. LED lights offer the best rated life so you should go for them. But keep in mind that the lumen output should still be decent. Know if the lighting will be used for adding decor to your home. You can consult an interior design as to what kind of lighting should complement your home decor, so they can make recommendations as to what kind of lighting you should buy or install for your ceiling fan. Know if the light source is easy to clean. As with the ceiling fan itself, you should have a light fixture and a light source that is simple to maintain. Having dust around your ceiling fan can also make the lighting accumulate dust, which can result to a dimmer lighting in your home or room. Q: What are the different kinds of styles that I can select for my ceiling fan? Traditional styles are great for adding details to your atmosphere. They are best for rooms with a bit of a formal touch and are ideal for adding warmth to any area. The material of the blades is usually wood or MDF but if you go for the higher priced ones, they are usually genuine wood. The light fixture usually has more details than other fan types out there. Modern styles feature less details and are more of the minimalist type. They are ideal for those who want sleek and clean designs in their home. The usual color motif of the modern fan is white with a touch of gray or silver. They usually have metal fan blades so they are best for larger rooms. Nonetheless, they feature a clean touch. Transitional styles feature a mix of styles, from contemporary to traditional, and are a mix of wood and metal. They are ideal for homes that feature both modern and traditional methods of decorating. They have a cross of intricate designs as well as sleek lines, so they are the best for those who want the best of both worlds. The blades can be of wood but the other parts can be of sleek metal. Period specific styles are those who want to follow a certain decor scheme for their room or area. Depending on the era or period that you chose for your decor scheme, you can choose a specific ceiling fan that matches that period’s style. These kinds of fans can be seen on most specialty shops that also feature chandeliers and other stylish home decor elements. Outdoor styles are ideal for those who have an upper deck, a patio, a covered porch, a terrace or any outdoor space that requires a ceiling fan. They are usually weatherproof and can either be damp rated or wet rated. They can also come in a wide variety of designs to match the design of your outdoor space. Q: How do you match the ceiling fan to your home decor or room? You should measure the room’s dimensions first so you can tell the salesman of the home decor store on which is the ideal ceiling fan size for your room. Small rooms may need small to medium sized ceiling fans while bigger fans will be ideal for larger rooms. Don’t make the ceiling fan too large or it will cause the room to have lack of space to breathe for guests and homeowners. You should also know the design or the decorating style depending on the theme of the room. As mentioned above the design of the room should be the basis for your ceiling fan, whether you should go for a contemporary, a modern or a traditional style fan. If your room has mostly wood then you should match the wood with the wood material or finish of your ceiling fan (e.g. cherry wood finish). This makes it more attractive and uniform with the décor of your home or area. If you have a room with mostly metal hardware then you should also match it with the metal parts of your ceiling fan (e.g. brass finish). You should look at the knobs of the drawers and match the material with your ceiling fan’s metal parts. The light fixture, if applicable, should be chosen carefully as well, so as to match the colors of your room or area. The lighting should be either the main lighting for your home or as a supplementary lighting. It should have the right lumens for your room size. Make sure the ceiling fan has a reasonable warranty or return policy so you can have a look if it is just right for your room. You can bring a shop assistant along if possible, so they can determine the best ceiling fan for your room or area. Q: What are the pros and cons of ceiling fans compared to air conditioners? Cooling ability Ceiling fans can only cool down people, not rooms. The air conditioner is capable of cooling the whole room. Noise levels Ceiling fans can be noisy if they are made of metal. Some air conditioners can be noisy if they have a loud motor. Safety Ceiling fans are only not safe when they are situated below 7 feet from the ceiling. Air conditioners are generally safe due to the closed design. Cost Ceiling fans are usually cheaper in operational and upfront costs. Air conditioners can usually be costly both operationally and for the initial expense. Air quality Does not make the air dry, but does not purify the air either. Makes the air dry, but can have an air purifier built-in. Q: Which is better for a bathroom: a ceiling fan or an exhaust fan? Noise levels: you should consider whether to use an exhaust fan or ceiling fan based on the noise levels in your room. If your bathroom is large enough then noise levels might not be an issue. Exhaust fans can be noisy but there are models that are less noisier. Ceiling fans are quieter in terms of noise level, but the ventilation might not be as good as an exhaust fan. Ventilation power: as we mentioned above, ventilation is best with an exhaust fan for a bathroom, hence you need a bathroom with a window if you want to use a ceiling fan in the bathroom, so that the air can circulate better. In addition to that, the noise levels can be reduced with a window in your bathroom. Lighting: because exhaust fans don’t have lighting, they are not ideal for those who want lighting in their bathroom and ventilation at the same time, so it might be great to install a ceiling fan to your bathroom anyway. Q: Can a ceiling fan be installed in the kitchen? • It can help drive away the odors from smoke and other smells. • It can help save your A/C’s load on trying to cool down the entire house in the summer. • It can reduce the heat coming from your kitchen when you are cooking. Q: What is the importance of having a reversible fan direction for the ceiling fan? • Summer seasons can benefit from the counterclockwise movement of the fan to create a down draft to push down the cool air for proper ventilation. • Winter seasons can benefit from the clockwise movement of the fan to create an up draft to pull up the cool air and save up on heating costs. 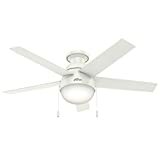 In the long run, the Hunter 51059 LowProfile is our best flush mount ceiling fan that has clean lines, good air flow, 3 speeds and a decent blade length of 42 inches.